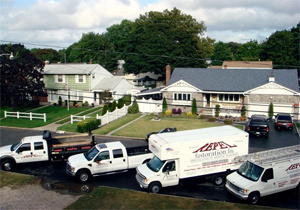 Repel Restoration is centrally located in Deer Park, Long Island, NY. We have been providing solutions for wet, moist and damp basements on Long Island for over two decades. Our basement waterproofing services are numerous; from crack repairs to install fully custom waterproofing systems. Most people have encountered the frustrating problem of cracks in their basement walls and stubborn water leaks after a heavy rain. They try to fix the crack themselves with a silicone based caulking, which usually doesn't get the job done. Unsatisfied with their "band-aid" repair, they remove the caulking and attempt to chisel out the crack in an inverted "v-groove" and fill it with the hydraulic cement. Hydraulic cement does not bond well to concrete and is very rigid. While the concrete expands and contracts with the change in temperature. Efflorescence (white calcium deposits or "fuzz") will start coming up around the rigid plug, followed by water. This is not a very effective way to waterproof your Long Island basement. After a couple of months the cement plug will become loose and water will begin to seep in from around it. If your basement has ever leaked or flooded, then you should consider a professionally installed quality basement waterproofing system. Without basement waterproofing, water problems are sure to become worse. If the proper attention and solution is not applied, water problems are sure to worsen. Even if water leaks are uncommon, your Long Island home's air quality can be impacted. If your plan is too finish your basement than having your basement waterproofed first is a must and usually a wise investment. Finishing your basement first could lead to costly repair bills in the future. 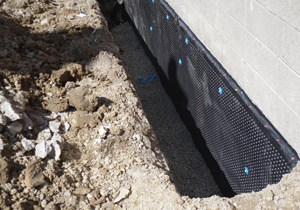 Our waterproofing systems can be designed to meet the needs of any home or basement, regardless of age or size. Foundation cracks and leaks are easy to spot but before these problems become apparent there can be many warning signs to a possible problem. Click here to learn about some of the most common basement water problems and their warning signs. Basement Wall Cracks: If you have cracks in your basement wall you should have a trained professional examine the damage. There are several reasons why foundation wall cracks occur. In most cases, cracks can be fixed utilizing a Hydro-Active grout compound. The main purpose of hydro-active grout injection is to permanently fill the full length and dept of the crack to keep water out. then, water will not penetrate the crack and widen it further because the expandable polyurethane epoxy resin has bonded to each side of the crack. Over 95% of foundation basement cracks are non structural, the only problem is the seepage of water. 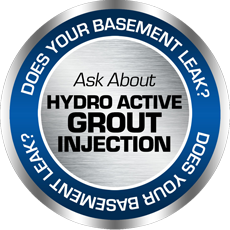 Hydro-active grout injection is the best choice for most basement cracks. The reason is, it bonds well to dry or wet concrete, even if the leak is active at the time of repair. Basement Foundation Cracks: When basement wall crack becomes a structural problem they begin to pose a health and safety risk to the home's occupants. This type of repair is highly technical and this kind of repair should be performed by a professionally trained foundation repair technician. This type of basement waterproofing repair is challenging work that may require powerful machinery and skilled oversight. You might be wondering whether your basement wall cracks are structural or are simply the result of normal settling over time. Only a trained basement technician can accurately assess a crack to determine the necessary course of action. Fortunately, the vast majority of basement wall cracks are the result of normal settling, and do not require full foundation repair. Whether your house is less than 1 year old or over 100, whether your foundation is masonry block or poured concrete, Repel's basement specialists have the ability and the experience to “diagnose and resolve the problem”. Our mission is to deliver you a dryer basement for the health and longevity of your home and every valuable inside of it. Homeowner tips to keeping your basement dry. What is Hydro-Active Grout Injection: Is a liquid polyurethane injection resin. When applied by the professionals at Repel restoration it will seal leaks and fill voids in concrete and masonry structures. Typically, this type of repair is less costly and in many ways a better solution to your basement waterproofing problems. This grout must be mixed with a specific catalyst and then injected. when done properly it forms a tough rigid foam seal that cannot be penetrated by water. This grout is typically used to stop gushing leaks, fill voids, and rebuild old or damaged construction joints. This particular method of basement waterproofing has proved to be extremely effective here on Long Island. Click here to learn more about our Hydro-Active Grout Injection. Your basement should be waterproofed but there are some problems that are simple to correct that often worsen or exacerbate the water problem . One of these is poor or blocked drainage. prevents mold and mildew that can harm the health of residents. Click here to learn more about mold & mildew. produces energy savings - a basement can become cold in the winter. Basement waterproofing not only seals out seeping water, it also seals from air leaks. Less cold air will enter the basement and your Long Island home will stay warmer. Basement waterproofing, especially on Long Island is something that everyone with a lower level area of their home needs to consider. When water levels in the soil around basement walls and foundations build up, they seep through the cracks and weaken the structure. Excess water can also damage the home with mold. Click to learn more about our basement waterproofing services. I don't normally write thank you notes but your professional and immediate response was so appreciated and needed, that I felt a note of thanks was the least I could do. As you know my basement began leaking badly at the same time that I was preparing for my daughter's wedding the next weekend. The last thing my wife and I needed was a construction crew working around the house and digging up the yard that we had just spent a month fixing up. Each drop of water that came down made our collective blood pressure rise. Keeping the problem from my daughter, I thought would be next to impossible. I could write a novel about this, but to sum things up, you personally came in, cleaned up before and after the process, the injection grout stuff you used solved the problem and we were not interrupted at all in our preparations. You were simply fantastic. I will absolutely recommend you to anyone I know that needs basement waterproofing services. Thank you for a job well done. My wife and I never planned on needing our basement waterproofed so when the water came it was a very stressful time. As you may remember, I had other contractors come in and quote me for the job. Price was a huge concern , but even more important was to get the job done once and correctly. You put my mind at ease and it was a bonus that you were also the least expensive solution. Although satisfied with my choice I still had some nervousness that day the job was to be performed but, I can't thank you enough for how well you treated my family and my home. It truly was a welcome experience to work with such professionals. CAN I GET A WATERPROOFING ESTIMATE OVER THE PHONE? At Repel Restoration will believe it is impossible to give an accurate quote over the phone. Every Long Island basement water problem is different and it must be inspected and evaluated in person. Even if it is just a small basement foundation crack that can be easily sealed, you should have a trained expert inspect the crack to determine what might have caused the crack and what is the best method of repair for that home and situation. Take advantage of a free in-home consultation and get educated on your unique problem. Repel Restoration waterproofing solutions apply only the highest quality and well-developed solutions to your home. We will customize our basement waterproofing solution and make sure that your basement is dry from the ground... UP or DOWN. 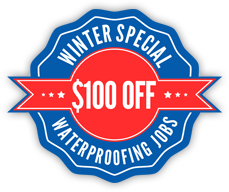 Let one of our basement experts come and give you a custom waterproofing estimate for free. Repel Restoration Inc. is centrally located in Deer Park, NY. We service all of Long Island, including the towns of Lloyd Harbor, Lloyd Neck, Huntington, North Babylon, Dix Hills, Northport and all of Islip. If you do not see your town on this list - rest assured the professionals at Repel can still service you. We look forward to and appreciate your business. Click Here to view our Basement Waterproofing Service Area page.